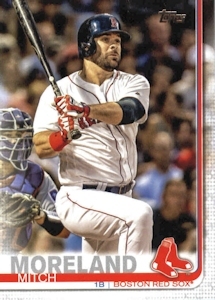 ON THIS DATE (April 11, 2019) ... Mitch Moreland took his role as Mr. Clutch to another level, smashing a game-tying homer in the seventh and an equalizing double in the ninth. The double set up Rafael Devers for a bouncy, walk-off single through a drawn-in Blue Jays infield that gave the Red Sox a badly-needed 7 to 6 victory. The Sox were just two outs from defeat in a game that would have dropped them to 3-10 on the season. But Moreland simply wouldn’t allow it to happen. Instead, he helped the team escape an early 5-0 deficit and got it off the mat when it fell behind again, 6-5. Give the Sox credit for this: They chipped away with three in the third, another run in the fifth and then had Moreland at the plate in the seventh ready to do his thing. The left-handed hitter worked Joe Biagani for an eight-pitch at-bat and launched one into Boston’s bullpen in right-center field, sending such a loud jolt of energy through Fenway that it suddenly felt like 2018 again. When Freddy Galvis took Ryan Brasier deep in the eighth to put Toronto back in front, it felt like the early-season 2019 Red Sox again. But when Mookie Betts drew a one-out walk in the ninth, Moreland was coming up. This time, Moreland worked a seven-pitch at-bat against closer Ken Giles, which he finished with a laser-beam of a double (106.8-mph exit velocity). The pitch from Giles purred in at 97. Betts roared around from first to tie it. There was still the matter of winning the game. Eduardo Nunez helped make that possible when he ran for Moreland and stole third. After a walk to Xander Bogaerts, Devers stepped up with the bases loaded and one out, but no RBIs yet on the season. That changed when his non-descript grounder found some outfield grass and Nunez touched home to win it.